For a complete listing of kosher facilities, visit the Atlanta Kashrus Commission website at www.kosheratlanta.org. The Spicy Peach: 404-334-7200, 2887 N Druid Hills Road, Atlanta, Ga 30329, dairy, cholov yisroel and vegetarian foods including soups, salads, paninis and ice cream. Dairy and meat catering available. Krispy Kreme Donuts Stores: select stores under AKC supervision posted at each location, also in grocery stores with AKC symbol. The Spicy Peach 404-334-7200, 2887 N Druid Hills Road, Atlanta, Ga 30329. 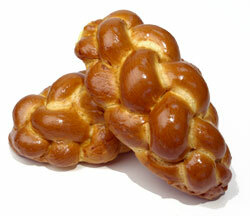 All kosher groceries, cholov yisroel products, pas and bakery products, full line of Israeli products, candies and gifts. Dairy and meat catering available. Take-out hot soups, paninis and salad bar. Tables outside for dining. Publix: 404-638-6022, 2969 North Druid Hills Rd., kosher dairy and pareve bakery, meat, fish, sushi, and deli or vegetarian subs. The closest hotel within the Eruv is Courtyard by Marriott Atlanta Executive Park/Emory, a 2-mile (roughly 40 minute) walk. 404-728-0708; 1236 Executive Park Dr NE, Atlanta, GA 30329. *There is an apartment complex a couple of blocks away that sometimes has guest units to rent overnight, call Post Briarcliff, 404-235-3477 to check date availability. A Post resident needs to make the reservation and pay the deposit - please call Beth Jacob after you have confirmed date availability so we can connect you to someone who can help make this arrangement: 404.633.0551. La Quinta Inn Midtown-Buckhead is also within the Eruv, a 2-mile walk (roughly 40 minutes). 2535 Chantilly Dr Northeast, Atlanta, GA 30324. 1-404-321-0999. *For a full and up-to-date list of kosher-approved resturants and grocery stores, visit the website of Atlanta Kashrus Commission led by Rabbi Reuven Stein, www.kosheratlanta.org. *Visit MARTA (public transportation) to see their route and schedule information (www.itsmarta.com) or call 404-848-5200. If you need assistance with Shabbos hospitality, please contact Mrs. Judith Levitt at 404-679-6069 or 484-433-6724.